Together with Barbados, Guadeloupe is one of the east Caribbean’s most consistent surf destinations. As well as regular trade wind swell it also receives N swell produced by cold fronts moving off the US East Coast in winter. Like Barbados the waves are often windy and rarely get bigger than 8ft (2.5m). French-governed Guadeloupe consists of two main islands, Grande Terre and Basse Terre, joined in the middle, which viewed from above, reveals a butterfly shape. Guadeloupe feels very French, although it has its own unique ‘Creole’ style. Locals are generally proud to be both French and Guadeloupian. 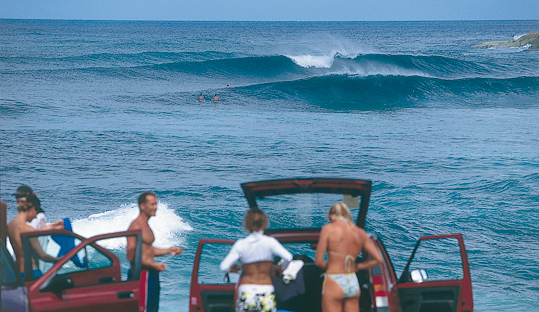 Grande Terre has the majority of the surf spots while Basse Terre only gets surf from S and W hurricane swells. There are also the exposed islands of Marie Galante and La Désirade offshore, which have good potential for explorers. The main swell season is from late October to March, with 2-10ft (0.6-3m) N-NE groundswells and consistent 2-5ft (0.6-1.5m) E windswells. Onshore trade-wind swell occurs year-round, but it will usually be small. Dominant E trades vary from 44% of the time in November to 70% in July. It tends to have a slightly more frequent NE pattern than SE, except during May-June and Sept-Oct. This is unfortunate as SE winds produce more offshores at the north-facing spots. The hurricane season (June-Oct) offers a better chance to surf spots exposed to the Caribbean Sea, but at this time of year there is no regular groundswell. There is little tidal variation. Like most tropical islands, the climate varies according to exposure to the trades. Grande Terre is the windward side of Guadeloupe, but being mainly flat it doesn’t attract many rain squalls from out at sea. Most of the rain falls over the higher side, Basse Terre. The wettest season starts in June and sometimes lasts until December, with heaviest rains possible during the hurricane season of June-October. Temperatures remain around 26°C (79°F) all year with little variation. Apart from visiting spice markets or sailing, Basse Terre offers enjoyable trekking around La Soufrière volcano. Diving is best at Îlets Pigeon, on the Caribbean side. There are mangrove swamps between the two islands. Many of the spots break on limestone or coral, often in shallow water, so watch out for reef cuts. Some spots have many urchins. Avoid hurricane season because Guadeloupe is right in their path and the surf is usually small at this time of year. Gear is expensive but available at Tong (Sainte-Anne). There is a surf school in Le Moule. There are lots of bodyboarders. The population is made up of local Guadeloupe and French expats. French is the official language though most locals speak Creole.